At the time I'm writing this, the U.S. has launched a pre-emptive war in Iraq. Unlike many wars which spring spontaneously into being, this was telescoped ahead by at least a year (or more). At this moment it is five days (5) since active fighting begun, though in a way the first Gulf War never stopped because the U.S. military had continued to fly aircraft patrols over Iraq with occasional bombing of targets. In any case, so far as the official public perception, this new round of fighting is 12 years after the first Gulf War stopped, and it began last Wednesday. 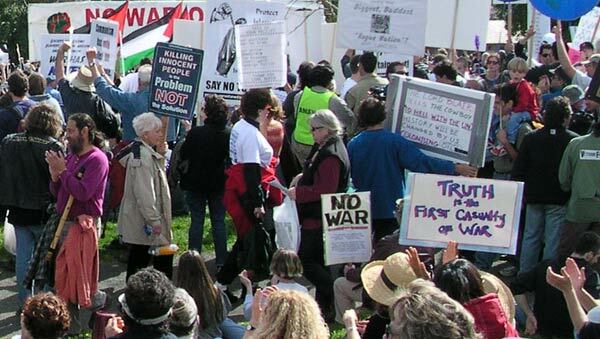 There has been a rising tide of anti-war protest over the last 6-9 months. I myself have attended three protest rallies, and have gravely mixed feelings over the whole process. First off, the justification for this is very weak. War is always indicating a failure of diplomacy (even if you consider war simply to be diplomacy conducted via other means), and I find it abhorrent because of the death and suffering that ensues. Even when loss of life is low, war always involves grave trauma (psychological and otherwise) to those who fought in it, and it is well known how traumatized people often go on to traumatize others (e.g. the children who receive child abuse often go on to be child abusers). Even if this war to be short and "clean", it will leave behind it a wake of trauma that will haunt us for years, just as the previous wars have left behind its own traumatized "War Hero's". Secondly, the people pushing for this war (the Bush Administration and other government leaders) have little or zero credibility. Most especially true here is the Bush administration and the cronies surrounding him in office. I have too much material on this subject for this article, so will write about it elsewhere. Basically, they cannot be trusted, and that they stole the presidential election in November 2000 only serves to confirm that they cannot be trusted at all. 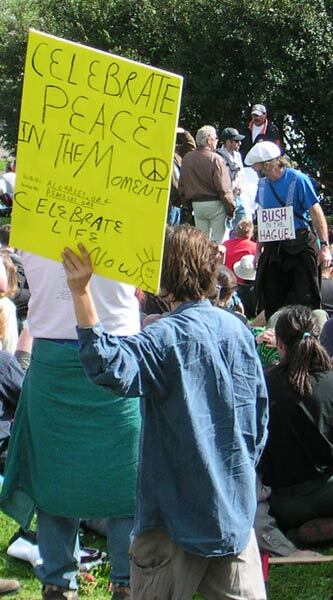 Thirdly, is the form of anti-war protest in general. 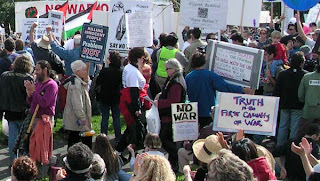 What I've observed is, the rhetoric, the words, the actions, nearly everything involved with these protests are simply creating a condition of making war on war. That is, by saying "NO WAR", how are you going to stop WAR? Obviously War is the worlds second most favorite pastime, and the second oldest profession, so it is ingrained in our being and society. To stop all WAR from happening, well, you'll run into resistance from those who like the practice of war. You can stand at the sidelines and repeat "NO WAR" until your throat gives out, and nothing will change until those who want to practice war decide themselves to stop it. But if you take an active role, doing some kind of interference with activities that create war, wouldn't you then be making war-like acts upon the warmakers, and thus become a warmaker yourself? 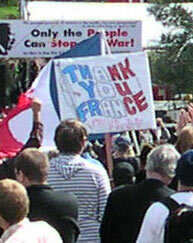 On March 15 the International ANSWER coalition (e.g. Not In Our Name) scheduled mass worldwide marches and rallies in many cities. Living near San Francisco, I attended that one. This rally explains the points above very well. Typical scene from the official protest. A bunch of people sitting in the park, speakers on the stage, protest signs in abundance, people selling literature and other materials, and generally a nice and peaceful day. A few of the signs evident. Here we have GW Bush praying to God, and someone else implying that GW Bush should be indicted for war crimes & sent to the Hague. But really, isn't the important idea to celebrate peace and life? 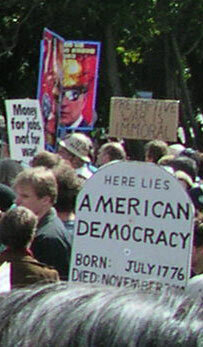 Here we have the fear that Democracy has died (in November 2000, when GW Bush "stole" the election). This war seems to be a blatant grab at the oil supplies of the Middle East. Regardless of whether it is, the american people are shooting themselves in the head with the wasteful cars we're driving nowadays. The other refer to the tone of the "Diplomacy" that led up to this war. First, GW Bush seems to have learned "Diplomacy" from his father, because in the first Gulf War GHW Bush kept making ultimatums which of course nobody would ever agree to, yet he would claim to be trying to negotiate with Sadaam Hussein. Same in this Gulf War, a long string of belligerant demands, couched as diplomacy, which nobody would ever agree to. Finally, we have France and Germany promising to veto any U.N. Security Council resolution approving a war. 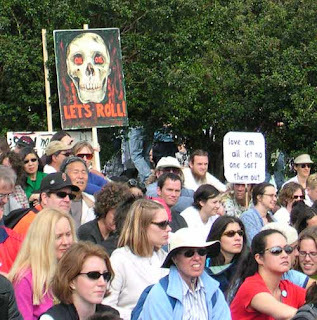 Among the anti-war crowd they became popular for standing up to the steam-roller drive to create this war. And to prove this is San Francisco, we have a naked man. He was just wandering around in the crowd, no doubt seen by any number of police, quietly minding his own business, and nobody bothering him. Gotta love this town. Remember my point earlier about making war on war? In this part of the protest rally, you have to look very hard to find it. There were signs (didn't manage to take a picture of them) accusing GW Bush and/or Ariel Sharon as War Criminals, accusing the United States of being the Terrorist here, accusing GW Bush of idiocy (e.g. "Somewhere a Village is Missing its Idiot"), and more. Similarly the speeches from the stage took the stance of "Not In Our Name", that is that the war is being made pretending that GW Bush has the country's approval, when in fact there is a great deal of disaproval in the country. Yet there was a tone of blasting the Bush administration, calling them idiots and worse. We gotta remember, the person at the other end of this war, Sadaam Hussein, doesn't have much going for him either. He (his government) has repeatedly massacred their own citizens, practiced brutal torture, attacked its neighbors, and more. Maybe the people of Iraq would be better off, as the Bush Administration promises, by kicking out this leader of a sovereign government. The cure (the war required to do the deed) may be worse than the disease, though. It's a tricky thing to take on the role of deciding for other countries who their leaders can be, yet the dialog from our government and among the people has been about "Can we allow Sadaam Hussein to be the leader of Iraq". It's clear few people like the fact that he's there, but who gives any outside organization the right to determine the ruler of a specific country? It's just like an abusive marriage, you know the woman would be better off leaving, but it's not for you to force her to leave is it? It's up to her to make the choice and take the steps herself to end the marriage. Maybe it would be better for the Iraqi people to, themselves, gather the strength, as a people, to topple Sadaam Hussein from power. No doubt that's what has made America so great, that we gathered the cultural strength to rid ourselves of an unwanted government. If this were all there were to this protest, I would have little to write about. Just this rambling mental masturbation. Regardless of the morality, the fact is that the U.S. Government has gone ahead and invaded Iraq, with the express intention of toppling its government. This is an absolutely blatant action. An action the likes of which America has undertaken before, but in previous decades it was always handled in a hush-hush behind the scenes matter, by sending in CIA operatives to work with local leaders, and the end result always seemed to be the replacement of a moderate somewhat democratic government with a brutal dictatorship. This time it's different, this time the government leaders (GW Bush and gang) have been talking for over a year about the need to topple this foreign government leader. The War in Iraq is right now in an indeterminate stage. US and British troops have spent 5 days establishing a foothold in Iraq, and have captured Basra (the port city at the mouth of the Tigris-Euphrates River), which they will then be able to use to bring in supplies. At the other end they are nearing Baghdad where the bulk of the fighting is expected to happen. It's hard to predict how this will turn out, since it may devolve to street-street fighting in Baghdad, going toe-toe with the Republican Guard. In other words, how long this war will be is anybody's guess. However it goes, it's clear the Bush Administration plans further wars, as there is a megalomaniacal plan in the background to setup a series of wars to reshape the Middle East in some way for geopolitical purposes. This means that one way or another there will be more of these protests. We are going to witness the 1960's all over again, with mass demonstrations only getting larger and larger, and the fighting in the streets only getting bloodier. Below I give a detailed report, with many pictures, of a side demonstration. Over 100 protesters who had been semi-peaceably marching down the sidewalk were arrested. 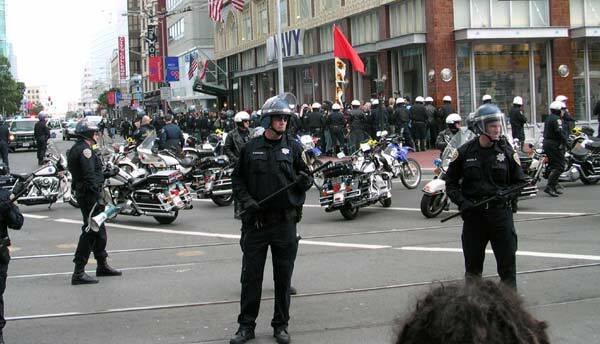 Later in the week, once the war started, the protesters turned out in mass numbers to disrupt the financial district of San Francisco, and thousands were arrested. In the media they are acting surprised that so early in the War is there mass protests already forming, but what they're missing is obvious if you only read the Black Bloc information below. Namely, these protest groups are merely followon efforts from the previous years demonstrations at various WTO or G7/8 meetings. Over recent years a growing backlash against Globalization has risen, with people attempting to take power for themselves. So much of our lives are being lost to the whims of giant corporations, who own all the media outlets, who determine what images we see and are bombarded with, who choose politicians, who write the laws, who subvert our freedom of choices by choosing for us what products end up in the stores, and more. Who is more important? The people? Or the corporations? This country was founded BY THE PEOPLE and FOR THE PEOPLE, not by the Corporations and for the Corporations. Somewhere along the lines this got lost, and the corporate interests subverted the picture. Where are these protests going? Who knows, really. A lot depends on the choices of everybody involved. The only thing clear is that it isn't going to stop anytime soon. This war is only a symptom of Globalization. I spent only a short time in the first part of the main protest. I got "called" to leave, thinking it was time to go home. 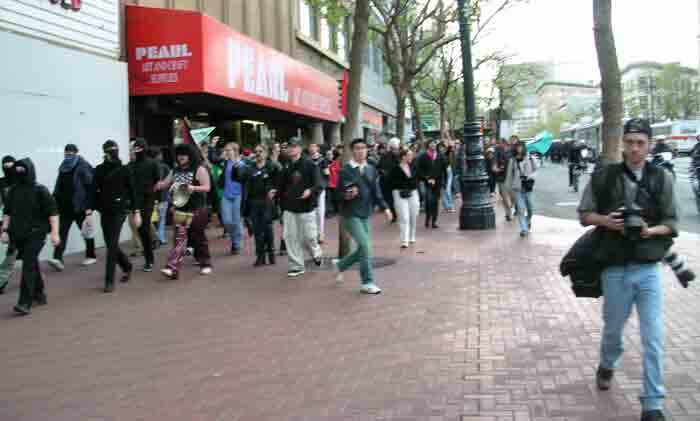 But on my way back to the BART station, I came across another protest march going down Market Street, which was being paralleled by a large group of Police officers. 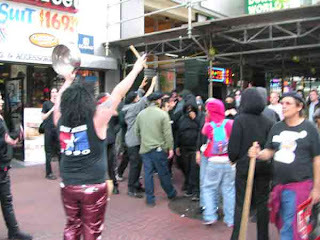 http://sf.indymedia.org/news/2003/03/1582971.php This is a report from an independent reporter who was at basically the same place I ended up. 3:08 sheriffs let people in from south sidewalk, from the east, so i just walk through to witness arrests. 15 people are sitting with arms linked on Mission, surrounded by about 10 cops. cops start arresting. 3:17 officer 947 uses starts tearing at the right ear of an arrestee for no apparent reason. when the arrestee is raised to his feet, officer 473 holds the man's throat from both sides, rubbing the vagal sinuses. 3:24 three scream from the 3 remaining protesters in the street. 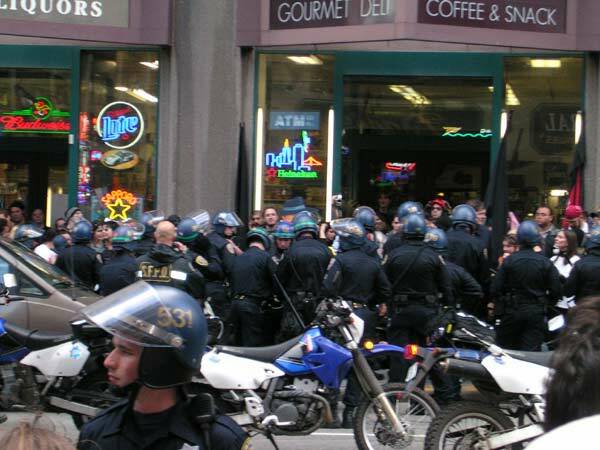 i can't clearly see what's happening, as they are completely surrounded by cops. 3:25 one woman appears to be on her front on the ground, with a cop pulling her hair to lift her head. 3:38 cops stop blocking the street, march away. I hear a Channel 7 reporter refer to the march as “the Black Flags,” which I have to tell her is a musical ensemble from the 80s. 3:40 protesters retake street. 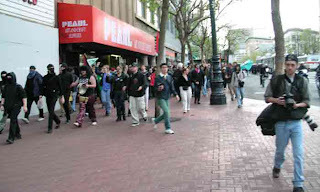 walk north on tenth, then many break into a run to 9th & market. 3:43 i hear that a protester was hit by a civilian car, but can get no verification. 3:46 Capt. Springer warns more of unauthorized march. He clearly wants to keep people from getting past 7th Street. I notice that the MUNI buses ahead are all backed up, so I go forward on my bicycle to check out the scene. 3:51, at the other march: I get to SF Center (at 5th & market) just as the march arrives. shoppers are locked out by nervous security guards. The march proceeds by without apparently breaking anything, not even knocking over any newspaper boxes. totally peaceful. still, 100 cops are present for the 500 or so marchers. 3:55 many marchers abruptly sprint south on fourth. 3:59 Three marchers are arrested at 4th and Mission. Cops push them back to Market Street. 4:01 I see another arrested person on 4th near Market, and a bystander tells me he was grabbed from the crowd by a group of cops, though he wasn’t apparently doing anything at the time. I felt like filing this story, so I left. After riding around a little, I got to the office at 3rd & Market, and found that cops had closed 3rd to cars and were getting read to clear the street and sidewalk. 4:16 A man in black abruptly runs east down Stevenson. A sheriff’s deputy runs after him into the Hearst Parking Garage. 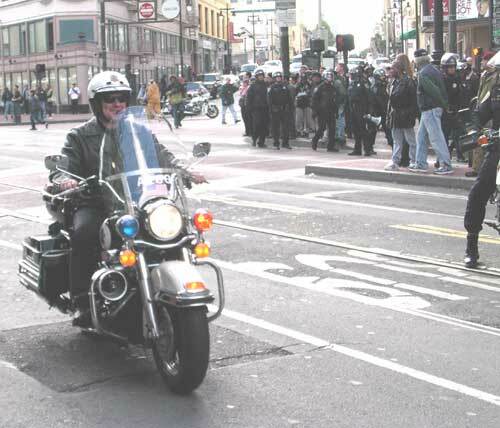 Four motorcycle cops go to help. The guy turns tail and evades the motorcycle cops, one of whom rams my bicycle. The Sheriff’s deputy, I see, had dropped his can of pepper spray, as though he was ready to use it. 4:18 about 40 cops in helmets run down Third Street to clear it. I go into my office to file this story. This writer was within 100 feet of me at 4:16, because I witnessed that same event (well, I didn't see the pepper spray). This picture shows what I saw. A big group of people, and a massive police presence. 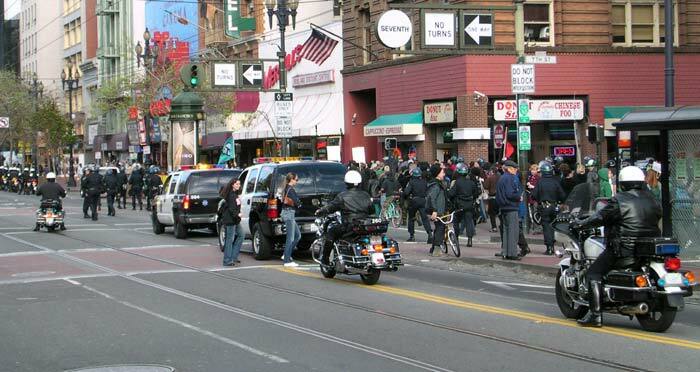 At the far left, those are individual police helmets (motorcycle cops), the police are in the street, and the crowd on the sidewalk were loud protesters marching as a group. 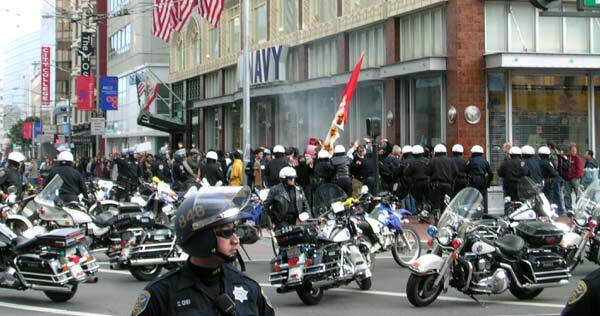 The Police attempts to control this crowd meant blocking Market street. Police were running back and forth across the street, though mostly they were in phalanx formations (lines) ringing the sidewalks. There was tremendous tension everywhere, with the police having a very menacing demeanor about them. The number of vehicles of all kinds (including multiple helicopters circling overhead) was impressive, and made for a lot of drama. 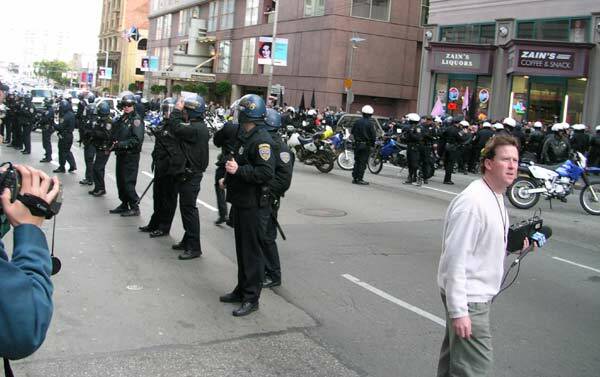 Part of the intimidation was the threat "Stay on the sidewalk" (implied: you'll be arrested if you step off). Mostly they were in lines everywhere, and a tremendously grim looks on their faces. Never before have I witnessed activity like this. For me the biggest danger police have meant is their not-so-gentle reminder to drive within the speed limit (if, by "reminder", you mean a speeding ticket that then causes high insurance rates). Yet, here were a group of people purposely playing games with the police. 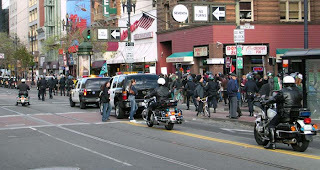 Near one intersection they clustered close together, and began counting "1..2..3..4.." up to "..10" and then charged for the intersection, the police madly chasing after them, in a mad rush to see who could take over the next street first. 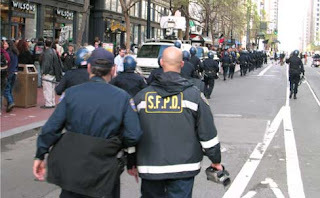 They rushed into the next street, the police close behind them, there was a bit of a shuffle down the street (I was too far to clearly see), and then they all rushed back to Market Street. The games continued in this vein for many blocks. The crowd on the sidewalk obviously wanted to take over the street. In a way this is like the main winning strategy in Reversi (a.k.a. 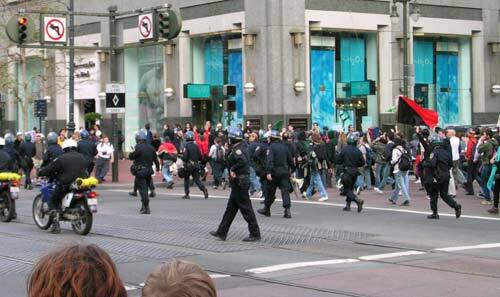 Othello) where the one that can control the center of the board generally has more control, and the Police were doing a good job of controlling the street and had a strong position from which to control crowds on both sides of the street. 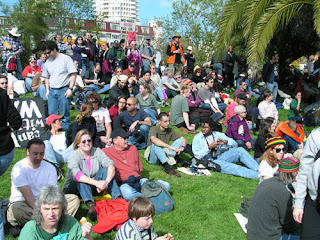 The crowd causing most rowdiness was on the south sidewalk, and I mostly stayed on the north sidewalk where it was relatively calm and you could witness from a safe distance. I felt incredibly nervous the whole time, yet at the same time felt like I had to stay and witness this activity. What's he grinning about? Doesn't he feel the incredible tension and palpable fear in the atmosphere? Just goes to show, some people totally enjoy this kind of environment. I spent a short time across the street with the rowdy crowd. I apologize for the low quality. 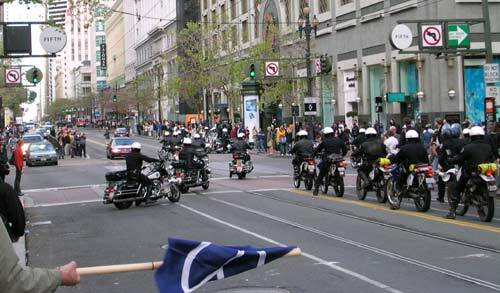 I was very nervous, the situation was extremely fluid, they were preparing to make another round of marching down the street, and I had to move quickly. Having witnessed them up close, they were merely being loud, not extremely so, and they had a BIG ATTITUDE on. I had an incredibly palpable feeling THESE PEOPLE ARE GOING TO BE ARRESTED (or else, that they want to be arrested) and as I most certainly did not want that for myself, I had to run to stay ahead of them. For drums they used pots and pans, or plastic buckets. "Although there is no consensus among us on what we all believe, I think I can safely say that we have a few ideas in common. The first is the basic anarchist philosophy that we do not need or want governments or laws to decide our actions. Instead, we imagine a society where there is true liberty for all, where work and play are shared by everyone and where those in need are taken care of by the voluntary and mutual aid of their communities. " "We believe that destroying the property of oppressive and exploitative corporations like The Gap is an acceptable and useful protest tactic. We believe that we have the right to defend ourselves when we are in physical danger from tear gas, batons, armored personnel carriers and other law enforcement technology. " "We live in a society that is racist and homophobic and sexist and unless that is taken out of our society, it cannot be taken out of the cops who enforce the rules of our society. In an even larger view, we live in a society that has agreed to give some people the right to control what others do. " "Violence is a tricky concept. I'm not totally clear what actions are violent, and what are not. And when is a violent action considered self defense? I believe that using the word violent to describe breaking the window of a Nike store takes meaning away from the word. Nike makes shoes out of toxic chemicals in poor countries using exploitative labor practices. Then they sell the shoes for vastly inflated prices to poor black kids from the first world. " A Financial Times (of London) special report on the WTO/Genoa protest, including a bit about the Black Bloc's (specials.ft.com/countercap/FT3BG4GLUSC.html). There's lots more available, easily findable by going to Google and typing in "Black Bloc". The point is, it's clear after a week of educating myself, that the popular press has made these people out to be "Hooligans" taking advantage of a larger protest to cause some random damage and have a few thrills. Having seen them up close, I can say that Mary Black's (pseudonym) letter (above) is much closer to the truth than the idea pushed on us by the popular press. Since the popular press is corporate owned and controlled, and totally subverted to corporate needs, their job has to be to diminish any message the Black Bloc or other activists would have to present, which only makes them want to act out even worse just so they can get any kind of attention. And, she's right, "Violence" is tricky. But, as the question has been rumbling in my mind for months, "Is violence the best use of power"? Here's one of the main learnings I've had over the last few months. POWER is often seen by people in its negative form, where POWER is already corrupted, and is used against others. In truth, power is merely power, meaning that it is someones ability to affect change in the world. In particular, each of us have within us the power to shape our lives in the way we want, regardless of the apparent obstacles in front of us. What makes it NEGATIVE POWER is when it is used as a weapon against others. If practiced in complete centeredness, in alignment with the divine plan, and in alignment with your true wants and true needs (we're not talking ego wants/needs like having 10 Cadilacs in the garage), then POWER cannot help but create great beauty and true peace in the world. It takes a lot of integrity and continual self inquiry to learn to practice POWER in this way. The self inquiry is there to explore your actions (perhaps after the fact) and see where your ego has Eased God Out of the picture, and where your divinity has allowed God to sneak back in. The reality is that we all inhabit bodies, meaning we all have EGO's (Easing God Out), even the saintliest of us have our moments of rejecting God (note, by God I refer to a generic concept of Divinity which is the aspect of each of us that is in unison with everything everywhere, and I specifically do not mean the old judgemental Man who's going to Smite us for our every Sin). By having an EGO, we always have a part of us acting outside the divine plan. In any case, back to the Black Bloc. 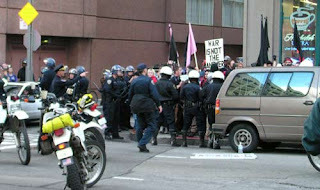 After seeing the Black Bloc, I skedaddled across the street at the earliest moment. I was very intent on not getting arrested. So I shadowed them from across the street, taking pictures as I went. I did feel clearly, what I was doing was incredibly important, if only to be a documentary check on the Police from overstepping their bounds and roughing up the crowd. 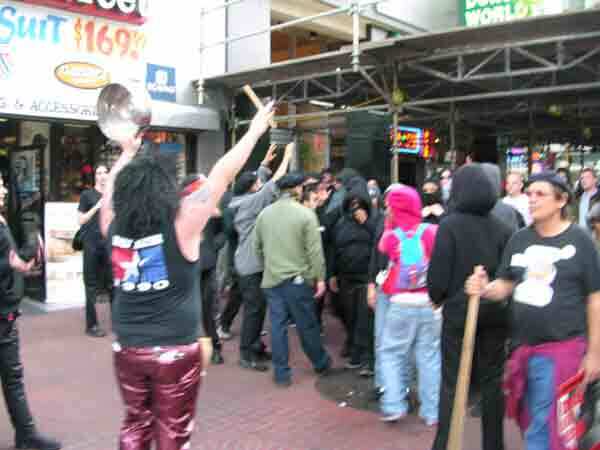 For all their bravado and bluster, this Black Bloc was relatively peaceful and not at all causing any damage. 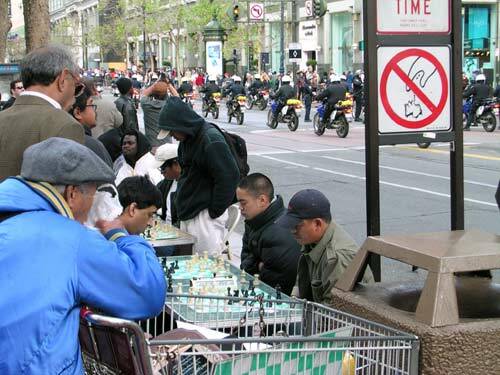 One of the never-ending fixtures of Market street is the chess players. They are there every day, and there are homeless street people hanging out there who are supreme chess masters. When I saw them, the irony struck me, of the war-game being played in real life that day, contrasted with the abstracted war of the Chess game. Who's causing more trouble? 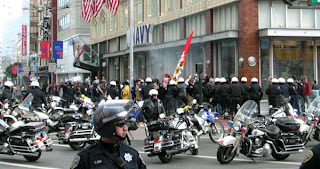 The Black Bloc making noise on the sidewalk, or the police blocking the street? The Black Bloc had the intent to block the street, and they succeeded, but had to enlist the police to block the street for them, rather than doing it themselves. Hmmm.. Here the Bloc had attempted to take over a side street. The police presence was thick, with an inner ring surrounding the crowd, and an outer ring preventing the rest of us from going to the crowd. Notice the cloud of smoke - there were two that rose around then, and it's not clear what the smoke was. They look very meanacing, don't they? That's their intent. I have a friend who has done a lot of these kind of protests, have run with Black Bloc groups, and is also (now) a healer. He pointed out that the police MUST use the energy field, they MUST send out extremely menacing energetic forms, or else how could a group of 100 police control a crowd of 1000? 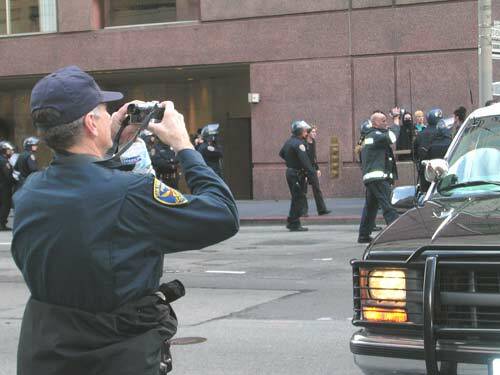 There were many cameras present, some in the hands of Police. These two officers were running around everywhere taking pictures of everything they could. One of the flaps currently in San Francisco is that the Police are using undercover police to infiltrate the protesters groups, giving other undercover police cameras and dressing them up as tourists to benignly take pictures of the protest crowds, in order to build up dossiers of whoever is attending the protests. Supposedly this is illegal. But let's be realistic here, one of the jobs of the police is to protect the property of citizens. It is well known that protests sometimes involve damage to property. If the police stepped aside and let the anarchists do as they wished, they wouldn't be doing their job, now would they? At the same time, there is freedom of assembly to consider. I suppose having police recording the people who attend public assemblies, this would put a damper on people attending them, and could be construed as creating an environment of hostility towards public assemblies. Nice sentiment - War is Not the Answer - but these protesters spent the night in jail. This is where the arrests occurred, over the next couple of hours. Again, two lines of police. This time one group making arrests, and again the other group menacing us on the sidewalk. 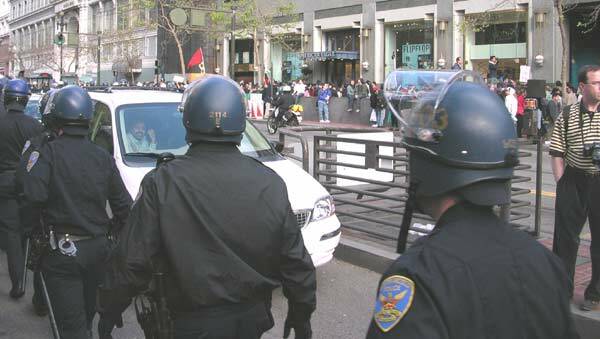 One time this line of police charged us on the sidewalk, and I felt this intense and palpable wave of INTIMIDATE pass by me. They stopped right after that, probably they just wanted to get our attention. They sure did. This is what we were kept away from (notice baldie taking his home movies). This is on 3rd Street near Market. Coincidentally (maybe) it is across the street from the Hearst Building (e.g. the original home of the Hearst empire, the inventor of Yellow Journalism, where you can print any lie you want, so long as it sells newspapers, and who cares if it starts a war because that'll just sell more newspapers). Down the street was a school-bus type vehicle, but it was armored with plates of steel, with slits cut in them, and painted "SHERRIF" on the side. As people were arrested, they were taken to the bus. Two, maybe three, of these busses were filled with arrestees over the next two (or more) hours. All the while those of us on the other sidewalk were experiencing various levels and forms of rage, all the while taking pictures and many calling out "The whole world is watching". I must not have been the only one feeling the importance of documenting this, to keep the police in check from going overboard. There was a young lady repeatedly calling out "Peaceful protesters are being arrested ... SHAME", with many in the crowd joining in with this. I exchanged some words with a woman - she was incensed, sheer hate spewing from her eyes, calling GW Bush an idiot, "CAN YOU BELIEVE THIS", "Do you think he even cares about what we're believing", pointing out that President Johnson at least anguished over the Vietnam war, and eventually accusing GW Bush of being without soul. I said, "He has a soul, we all have souls", and that visibly clicked in her - she got it - she said clearly something like "Well, then, we'd all better pray for his" and walked away. That really touched me, still does, she got it, we all have souls, we all have the divine in us. And, behind her, in the street, the police were leading arrestees into the bus marked Sheriff. The process of arresting people was very well organized and orchestrated. Obviously they have a lot of experience with this, both sides. The police had huge bundles of plastic cable ties being used as handcuff's. They would, one at a time, pull people from the crowd and most of the time was able to calmly slip the cable tie around their wrists and lead them away. On the way to the bus their picture was taken, and they were led into the bus. On the sidewalk was a woman calling out to the arrestees "What is your name" and offering them legal help. Some answered, maybe some were too dazed to notice her, and in any case she had to stay on the sidewalk or risk being arrested herself. Often the arrestees were dragged away, purposely being limp in the classic Ghandi-inspired non-resistance mode. Continually I had trouble feeling what was really happening inside me. I am in such rage about this, it feels so fundamentally wrong for the police to have arrested these people. In this case the Bloc was not causing actual damage, and just walking down the street, but since the police declared them an "ILLEGAL ASSEMBLY" this no doubt gave them enough legal cover to do the arrests. Continually I felt "THIS IS WRONG", and helpless to do anything about this but witness, take pictures, and remember. There was a guy mouthing off "Break the Law, Go To Jail". Obviously he felt differently about the arrests, and had a very simplistic rule to back it up. Obviously supporting the police, and assuming that if the police is arresting someone, that the person being arrested must've broken the law. "Why would they be being taken to jail, if they hadn't broke the law" he kept saying. Since most of the crowd around him was war protesters, some were activists themselves, he wasn't very popular, but he stuck to his story, no matter how the yelling escalated between him and the others. I'm rather surprised it didn't break out as a fight. My worst fear (one of them) was being played out in front of me. This is that people following their hearts longing, and acting from their core beliefs, were being arrested and hauled away. Fortunately they weren't beat up (the other part of my worst fear) but that didn't make it any easier to watch. Instead, what I felt was a great deal of discomfort. Rage isn't my comfort zone, and it took a lot of intregity to surrender to the feelings in the moment, feeling the range, the wrongheadedness of what was happening, on all sides of the street, the constant danger and tension around me. Eventually I came to two moments of clarity, the first being the range of rage and tension and danger. The second moment of clarity was shortly after the first - no doubt I couldn't have gotten to the second without the first. I felt expanded into realizing the divinity of the situation. Everybody present had their presence of being, were acting from their own beliefs of what their best course of action was. 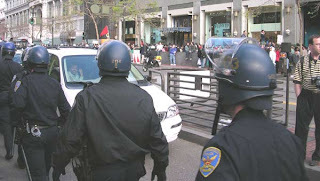 Above we looked at a few web pages describing the Black Bloc, and how they are acting from their beliefs. At the core of those beliefs is their own divine purpose, their divine mission in life, which they are expressing as walking down the street, taking the power back for themselves, demonstrating to the rest of us that people have their own power even in the land of corporations and police. But what of the Police? The nemesis of this scene, they too had a divine plan and presence here. They embody the framework and rules of society, and are in charge of personally maintaining the structures of society. For us all to live here together, we've decided to create ground rules and agreements of conduct between us. Without those ground rules, part of which are the laws, we know from experience that EGO will run rampant and many people get hurt. It is the police who are on the front line of enforcing this. It is a tough job. And the rest of us? The rest had such a mix of purposes for being present, and I was most present with the "WITNESS" aspect that I've already discussed for myself.